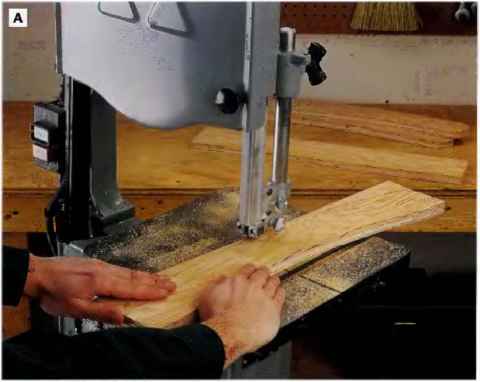 PHOTO A: Lay out and cut the four tahle legs on the band saw or with a Jig saw. Since the profiles of the legs match, mark and cut one to serve as a template for tracing the profiles onto the other three leg blanks. 0 Lay out one leg on a piece of 3/4-in. exterior plywood, cut it to shape, and use it as a template for the other three legs. To lay out the leg, draw two 3-in.-dia. circles with their centerpoints 22 in. apart. Mark the midpoint between the circles with a perpendicular line, for use later in locating the hole for the leg pi vot dowel. Clamp the workpiece to your workbench and extend the perpendicular line yon just drew onto the benchtop. Use this line as the pivot point for connecting the circles with a 48-in.-radius arc for the inner curve of the leg and a 51-in.-radius arc for the outer curve (See the Legs drawing, page 321). Drill a vl6-in. locator hole through the center-points of the two dowel holes in the leg. Cut out the leg and sand the cut edges smooth. 0 Trace the leg template onto three plywood leg blanks. Mark the centerpoints of the leg dowel holes by drilling through the loeater holes in the template. A), and sand the profiles smooth. O Drill the dowel holes in the legs (See Photo B). It is important that these holes be bored straight, so use a drill press or right-angle drill guide. PHOTO B: Bore the 3A-ln.-dta. leg pivot and lock dowel holes in the legs. These holes must be drilled straight through the legs, or the dowels will be difficult to align during assembly. 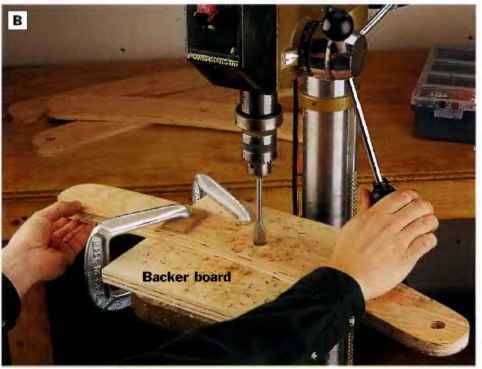 Bore the holes with a drill press, or mount your drill/driver in a right-angle drill guide. 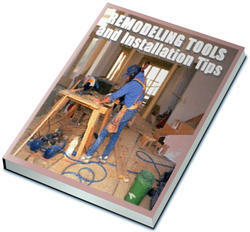 Set a backer board beneath each workpiece before you drill, to keep the bit from tearing out the wood as it exits. PHOTO C: Connect the lock dowel hole with straight lines to the edge of each stretcher, forming the iock dowel slots. Clamp the legs to your worksurface and cut along these lines. The width of the slots should be 13/lb in., to provide a loose fit for the 2M-\n-dta. lock dowel. © Make the slats. Crosscut six 16-in.-long blanks from red oak stock. Set the fence on your tabic saw 1 in. from the blade, and rip the 15 slats to width. 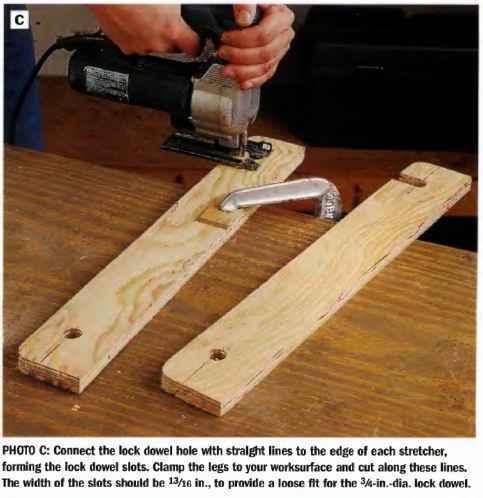 PHOTO D: Build a right-angle jig from scrap to help index placement of the counterbored holes In the ends of the slats, damp the jig to the drill press table so each slat is exactly aligned for drilling when you lay it in the jig. This way, there's no need to measure and mark each slat hole. pivot dowel hole and the hole that will form the base of the lock dowel slot on each stretcher (See Stretchers drawing, page 321). Draw the 3/4-in. radiused corners and cut them with your jig saw. © Drill the dowel holes. 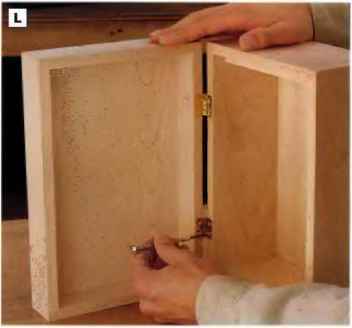 Note that, the diameter of the hole that will become the slot for the table lock dowel is l3/is in., so that the lock dowel can move freely in and out of the slot. Use a drill press or right-angle drill guide to bore these holes as straight as possible. © Cut the lock dowel slots in the stretchers (See Photo C). Use a combination square to draw lines from the outer edges of the %i.f>-in. lock dowel hole to the edge of the stretcher with the curved corners. Clamp the stretcher to your worksurface, and cut. along the lines to make the slots. © Finish the legs and stretchers. Fill any voids in the edges of the plywood with wood putty or auto body filler. Sand the parts smooth, Prime the legs and stretchers with a high-quality latex primer. After the primer dries, apply two coats of exterior latex paint. PHOTO E: Attach the first tabletop slat to the stretchers with screws. Lay the outer legs between the stretchers, and slide the table pivot dowel through the stretchers and outer legs. Pin the dowel in place with glue and finish nails driven into the dowel through the stretchers. Do not glue or nail the outer legs to the table pivot dowel. PHOTO F: Install the inner tegs between tire outer legs, and Insert the leg pivot dowel through the center dowel holes In the legs. Cut and insert the table lock dowel through the Inner legs. Pin the table lock dowel to the inner legs and the leg pivot dowel to the outer legs with finish nails. the ccmnterbored portion of the holes is 1/4 in. deep, to allow for inserting wood plugs later. (B Round over the edges and ends on one face of all the slats. The quickest method for doing this is to use a Vfe-in. piloted roundover bit in the router table. Or, you could ease these edges and ends with a sander instead. 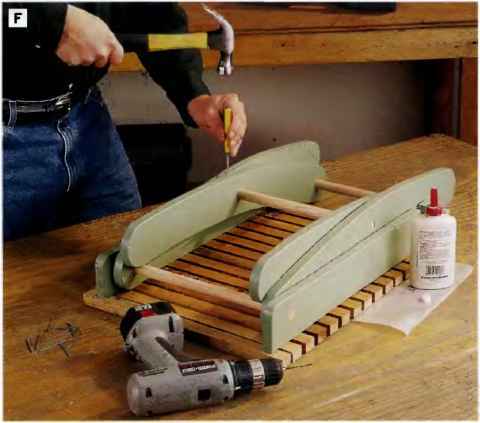 © Attach the first slat to the stretchers to help establish their alignment during assembly. Start at the end with the lock dowel slot. Position the slat so it overhangs the outside faces of the stretchers by 1 in. and the ends of the stretchers by V4 in. Fasten the slat in place with IV2-in. galvanized deck screws. © Install the table pivot dowel. Cut the dowel to length, and slip it through the end holes in the outer legs and stretchers. Assemble the parts so the concave profiles of the outer legs will face the tabletop slats. 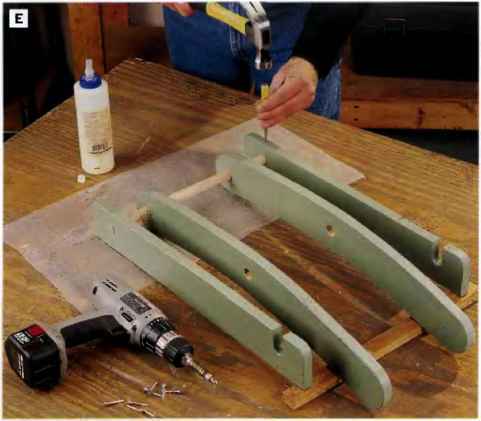 Fasten the dowel with glue and a #6d galvanized finish nail driven through each stretcher (See Photo E). Drill Vi6-in. pilot holes before driving the nails. Once fastened, the pivot dowel holds the tabletop frame in shape. © Attach the remaining table slats with screws. Start with the other end slat, overhanging it l/4 in. beyond the ends of the stretchers. Space the 13 intermediate slats V2 in. apart, with all ends lined up. Use spacers to help establish even gaps as you attach the slats. © Install the inner legs. With the table facedown on your work-surface, position the inner legs by setting them concave-side-down between the outer legs and sliding the leg pivot dowel through the center dowel holes in the legs. PHOTO G: Loch the Inner legs In place by drilling and Inserting Vi-in.-clia. dowels through the leg pivot dowel. Position the lock dowels to leave a slight hit of room between the legs, so they can move easily past one another without damaging the painted finish of the parts. by setting them concave-side-down between the outer legs and sliding the leg pivot dowel through the center dowel holes in the legs. © Cut and fasten the table lock dowel to the inni:r legs. Space the inner legs by sliding them lightly against, the inner faces of the outer legs. Insert the lock dowel through the end holes in the inner legs and position it so there is an equal overhang on each side. Fasten the lock dowel by drilling a pilot hole through the end of each leg and driving a finish nail into the dowel. © Install lock dowels through the leg pivot dowel. Tin: lock dowels hold the inner legs in place against the outer legs. It's important to leave enough space between the two pairs of legs for easy movement when the legs are opened or closed. 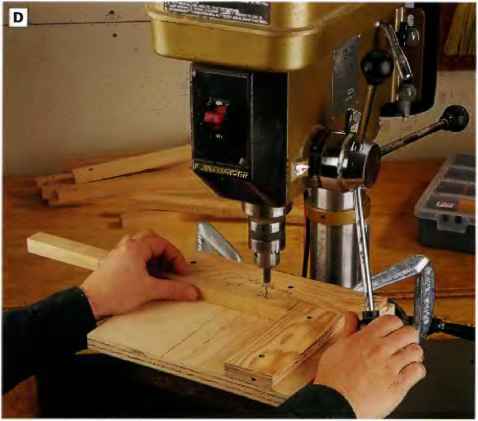 With the assembled table facedown on your worksurface, drill Win.-dia. pilot holes through the pivot dowel (See Plioto G). Cut the lock dowels to length, coat them with glue, and insert them. 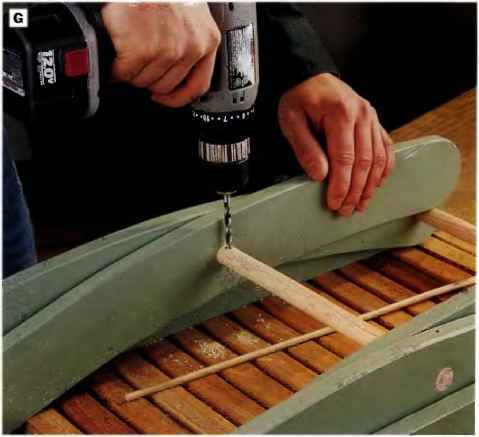 © Insert oak plugs with glue into the screw holes in the slats, let dry, and sand the plugged areas smooth. You could use wood filler instead of plugs, but the result will be less visually appealing. 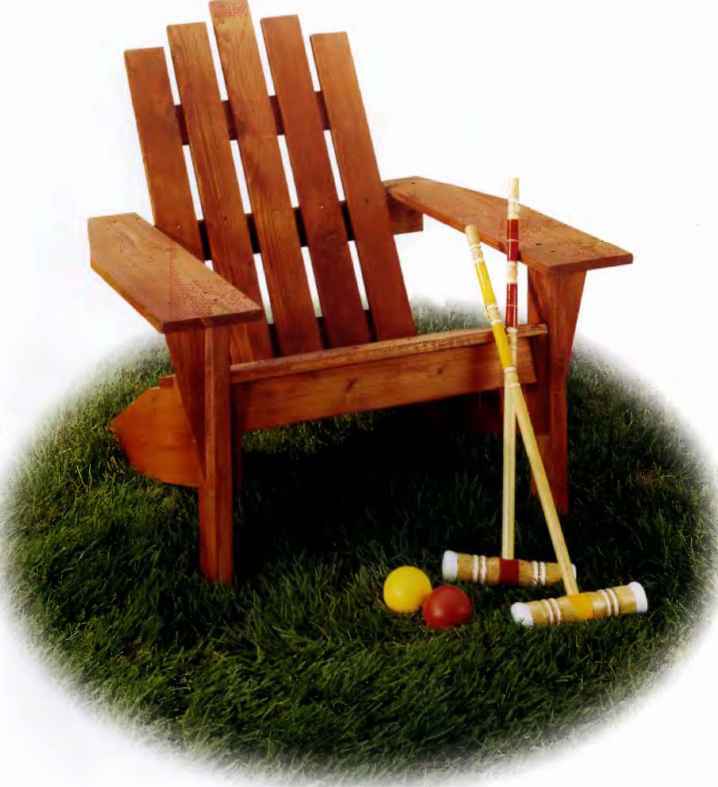 © Mask off painted surfaces of the table, and apply Danish oil or another clear exterior finish to the dowels and slats (See Photo H). 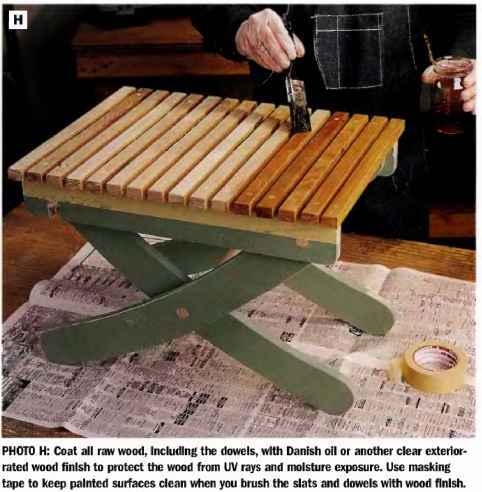 PHOTO h: Coat all raw wood, Including the dowels, with Danish oil or another clear exterior-rated wood finish to protect the wood from UV rays and moisture exposure. Use masking tape to keep painted surfaces dean when you brush the slats and dowels with wood finish.